An important part of fully appreciating a study abroad program is becoming immersed in the country’s culture, especially the food. However, like any college student, I try to save money whenever possible and prefer to not spend insane amounts on food. 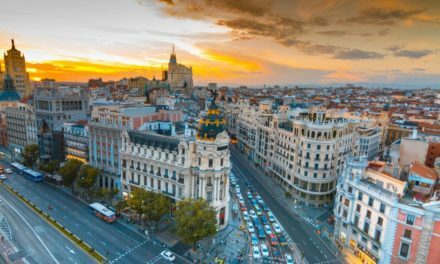 Because of this, my friends and I have gained the valuable skill of searching for inexpensive food options which still incorporate some of Spain’s culture and satisfy our cravings for delicious meals. Below, I am going to list some of our favorite restaurants so far and compare them based on price level and overall quality. Buen provecho! Buena Ventura – We found BV within the first couple weeks of our trip and began eating lunch there every day. This cafe has a menu with delicious sandwiches, nachos, omelets, pastries, coffee, and a wide variety of other breakfast and lunch options. The items vary in price, but the chicken avocado sandwich became our go-to meal since it is only €3. It is also a great place to study when it isn’t busy since it’s relatively quiet and provides free WiFi. Bonpreu – This supermarket is right around the corner from our school building, and it has a bakery inside in addition to the normal produce section. This is definitely our cheapest food option here; the bakery’s sandwiches are around €2 and their pastries are around €1. There are also several varieties of salads available for around €2 and plenty of snacks and candy at very inexpensive prices. We come here when we want a decent amount of food without paying a lot for it. Brunch & Cake – This restaurant is probably our favorite spot to eat so far; we have started a tradition of getting brunch here every Sunday afternoon. The menu here includes cake (obviously), sandwiches, pancakes, smoothies, coffee, and more picture-worthy food. While it’s not necessarily an expensive restaurant, we probably spend the most money here in terms of food (it’s definitely worth it). To give an idea of the prices, smoothies are around €6, the cake is around €5, and pancakes are around €8. We tell everyone they need to visit one of the Brunch & Cake locations at least once during their experience here in Barcelona. International House Cafe – Conveniently located right across the street from our classroom building, this cafe is perfect for grabbing lunch or coffee in between classes as well as getting some studying done. A coffee with milk costs around €1,25, and the small food items (croissants, mini sandwiches, snacks, etc.) are also reasonably priced. Hamburgueseria – While the food here is not necessarily authentic Spanish cuisine, I would definitely recommend stopping in for lunch at least once. Their giant hamburgers start at €6,50 and can be customized in many ways, and a large side of fries can be ordered for €5,50 as well. A trick that we have discovered to make these meals less expensive is to split a burger between two people and also share a side order of fries; trust me, it’s plenty of food. The waiters are very nice and speak English, and the restaurant itself has a unique atmosphere. Case Lola – Probably the most authentic Spanish cuisine out of all these options, this tapas restaurant has a beautiful and unique atmosphere and great food and drinks. Since it’s also near the school, it makes a great lunch destination for times when we’re willing to spend a little more money than usual to get delicious patatas bravas or meat and cheese platters.